If you are looking for the best car wash soap for black cars you are at the right place! One of the most popular color for luxury cars is black because of its classic style and air of sophistication. It is very striking and it will definitely stand out in the showroom. But, as soon as this car hits the road, it will be covered with dirt. Black is considered one of the best colors for a car, but it is also the hardest color to keep clean. Thanks to these 3 best car wash soap for black cars, cleaning your car will keep it looking beautiful. You want to get your car clean, but you also want to ensure that you get everything you expect from your car wash soap. Here are some of the things that you need to consider when buying. Whether you want to keep your vehicle protected from the rain or you simply want to boost the appearance of your paint, there is car wash that is designed to ​perform more than just one task. If you want to keep your car clean all the time, it is much cheaper to purchase a bigger car wash. However, if you plan to clean your car occasionally, then a small bottle is enough. Some car wash soaps require the help of other cleansing products. This is quite costly and at the same time makes your job difficult. It is best to choose a versatile car wash soap that is capable of doing all the things at the same time. The best way to clean your black car and boost your car’s protection, shine and glossiness ​is by using ​good car wash soap like Meguiar’s G17748. 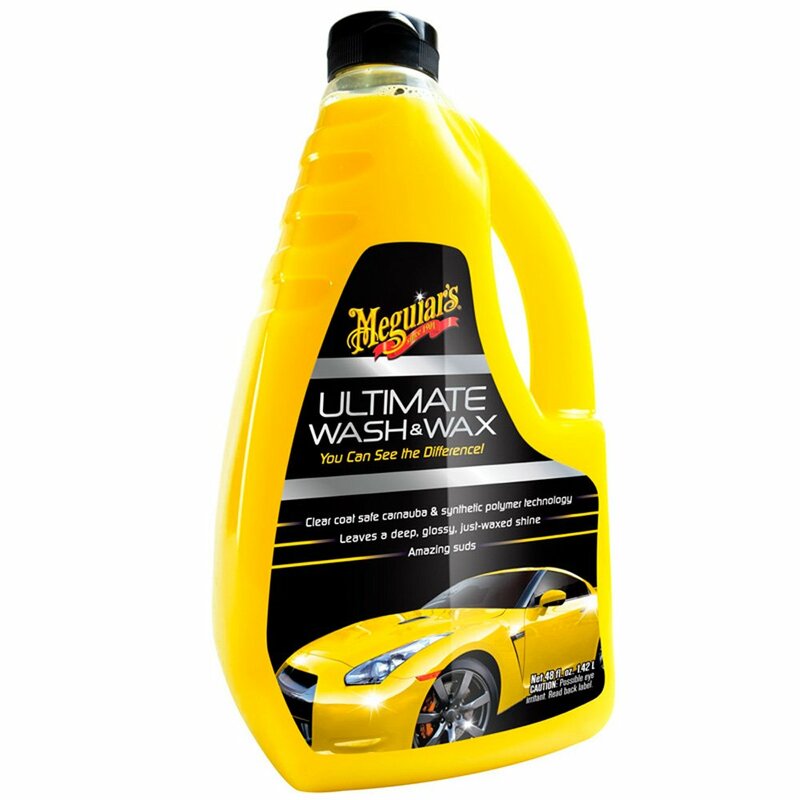 This product works well ​with all Meguiar’s waxes and washes. Ordinary wax and wash products are normally weak on suds, protection and shine. This product is non-detergent and provides excellent cleaning ability whilst ​lubricating the surface to help remove dirt and grime without damaging the paint. The best way to clean and shine in-between boosting protection, shine, regular waxing and glossiness. This formula is pH neutral so it won’t remove wax while carefully cleaning the paint. Reviews for this product were focused primarily on how well this wash and wax product actually worked! Customers loved how it was reasonably priced and how the well this product "suds up" and feels "very smooth going on". More than a few buyers loved how well it rinsed off of their cars. This comes in at our number one pick because of the sparkling clean you get on your car, that rinses away without residue. We don't recommend this product for individuals who prefer to have a separate wash and wax formula! All in all, an excellent product that even smells really nice! This Meguiar’s product was manufactured to clean and ​condition paint in one easy step. It contains an advanced formula that carefully foams away tough dirt, contaminants and road grime, without affecting the paint and wax protection. This car wash shampoo has an ultra-rich paint conditioner that removes any debris to show the real color and ​clarity of the vehicle, ​leaving a radiant look. This product was manufactured to both carefully wash and condition paint in one easy step. The best formula that offers rich suds that carefully and safely removes road grime, contaminants, and tough dirt. Ultra-rich paint conditioners that remove debris to display clarity and color, which leaves the paint, look radiant. Biodegradable and safe detergents.Safe on any type of paint and will not affect wax protection. It is a 2 in 1 product that washes and waxes. It can clean the dirtiest vehicles effectively. It does not affect the paint. It works even with pressure washers. It needs wiping after rinsing or it leaves behind a film. Some users think that the smell is a little bit overpowering. There were a number of reviews that loved how well this product held up against the filthiest of cars. This product has a very specific method, but customers say that if it is "done just right" their cars are pristinely clean! One customer said, " I think its a great inexpensive car wash soap"! 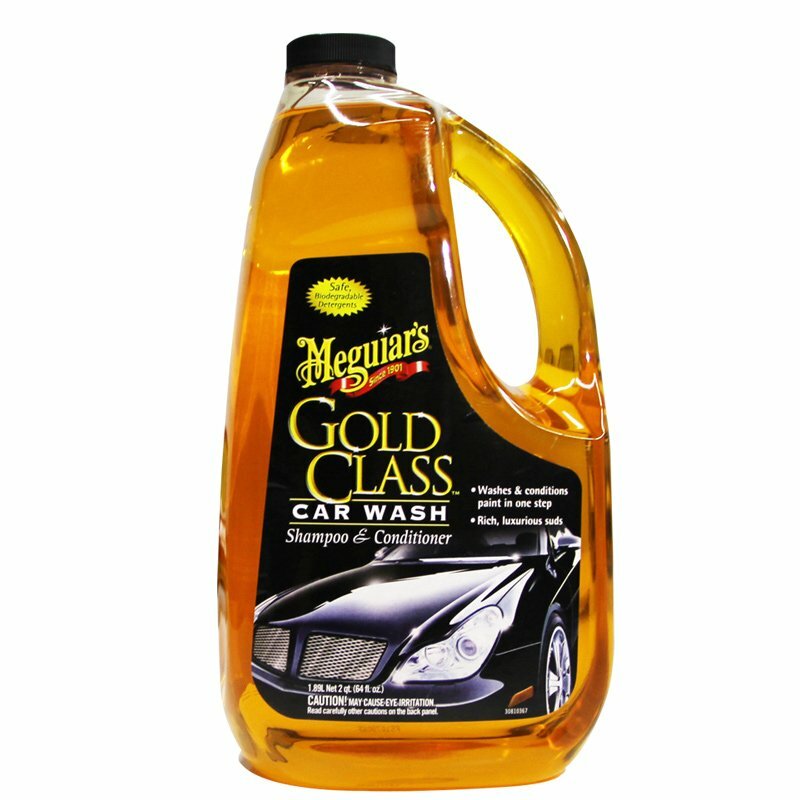 We like the Meguiar's G7164 Gold Class Car Wash Shampoo and Conditioner on our list of the best car soaps for black cars because it is a quality product with quality reviews. We love how well it makes even the dirtiest of vehicles shine like they were brand new! We don't recommend this to people who don't like powerful smells, as this product has a bit of strong scent. 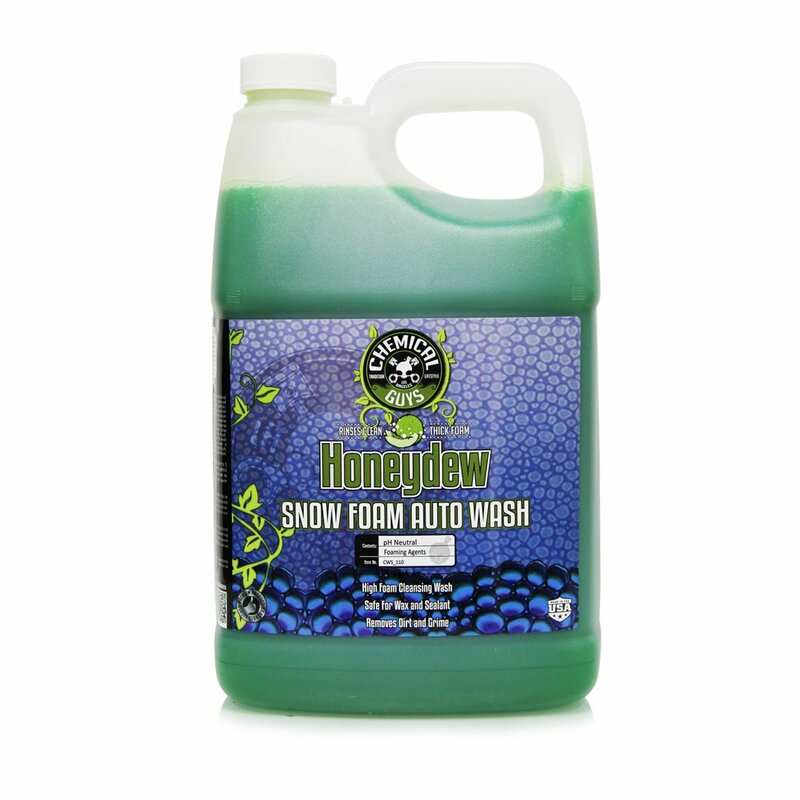 This HoneyDew Snow Foam is designed to create millions of cleaning bubbles. It can be used just like an ordinary soap and can be diluted in a bucket or you can use a foam gun, foam washer, or foam lance. This car wash removes dirt, environmental contaminants and grime, yet it is ​gentle enough on paint and ​waxed and sealed surfaces. Its pH-neutral formula removes grime and dirt ​from paint. Because of its unique formulation, it provides millions of cleaning bubbles that work fast at removing abrasive contaminants from your car paint’s sensitive surface. This product was manufactured to be safe on all car surfaces including vinyl, plastics, paint, glass and rubber. It can be utilized on gel finishes and boats, jet skis and RVs. You can dilute it depending on your ​needs. Perfect for touchless, foam cannon, or two bucket wash.
Removes dirt, build up and grime. Ultimate hybrid carnauba/polymer wash and wax. Might not get the exact amount of foam that you expected to have. Reviews for the Chemical Guys CWS_110 Honeydew Snow Foam Car Wash Soap and Cleanser are all about how thick and sudsy this product is. One reviewer stated, "One capful with the balance water makes soap so thick that I can do the whole car/truck before needing to rinse"! Lots of users liked this because it makes the product last for a LONG time. We put this product on our top three list of best car wash soap for black cars because even the smallest bit can go a long way! Additionally, it's a deep clean for a cheap price tag! We don't recommend this to people who don't have access to a pressure washer. However, we love how much time and money this product saves customers! Your car is one of your most valuable possessions, so it is important that you keep it at its best all the time. Rather than ​spending hundreds or thousands of dollars ​at costly car washes, you can do it on your own with the help of reliable and effective car wash soap. In addition, to wash your car effectively, I also use Generac 6596 Gas Power Washer. Read the ​review from Washwisely, try this out. Just make sure that you consider all the factors mentioned above before buying. We are sure that after reading the above reviews of the best car wash soap for black cars you will find the ideal product for your car!